Designed to match your home’s heating and cooling system. Time-delay electronic control extends fan operation for maximum air circulation. Direct drive blowers aerodynamically engineered for quiet operation. Reliable blower motor boosts efficiency. Triple-step paint process and structurally reinforced, rust-resistant, heavy-gauge galvanized steel cabinet for durability. Upflow or multiposition models available. Uses high-efficiency ECM motor technology to increase cooling efficiency. 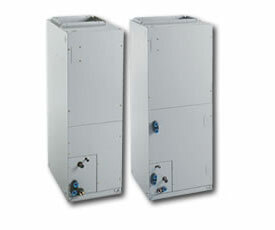 Uses high-efficiency ECM full variable-speed motor technology to increase cooling efficiency. Variable-speed blower motor gradually and quietly modulates up to reduce uncomfortable temperature swings. Airflow can be adjusted for personal preference. Continuous fan mode setting for improved air circulation. Multiposition to fit various spaces. Compact size for hard-to-fit spaces. Cased coil for higher performance. MB Series operates on standard 115V household current. MF Series is designed for 208V/230V operation. MV Series features high-efficiency ECM full variable-speed motor technology to increase cooling efficiency.